Share "Are Pet-Accompanied Workouts the Next Fitness Craze?" The benefits of exercise are well-documented, and as we struggle to stay fit, fitness crazes come and go. From jazzercise to home gym machines to fitness videos and video games to all manner of exercise classes, celebrity-endorsed fitness equipment, and workout routines, there is always a new trend to help us stay in shape. But are our pets ready to be part of the next fitness craze? The key to a pet-accompanied workout is that both you and your pet are moving, stretching and engaging in the physical motion that can keep you both healthy and fit. Whether you choose a simple, easy workout or a more formalized fitness routine, both you and your pet will enjoy many benefits of sharing exercise together. Just as you should consult a physician before starting any exercise routine, it is important to consult a veterinarian before getting your pet involved in your workouts. The vet can examine your pet's overall health and offer recommendations for the types of exercises that will be safest for your pet based on their joints, lungs, heart, age and general physical condition. Once you have the clearance to start working out together, always keep your pet's safety in mind with the physical activities you share. Start workouts slowly, with appropriate warm-ups to relax muscles and prevent strains. Time workouts to safe times of day, such as during cooler morning hours in the summer. Use safety equipment as needed for the type of workouts, such as a leash or pet life jacket. Stay properly hydrated before, during and after the workout. Build up the intensity and length of workouts gradually to prevent strains and injuries. Change workouts regularly to exercise different muscles and keep your pet's interest. Stay alert to your pet's signals for signs of fatigue, injury, dehydration, etc. Be aware of your surroundings to always keep you and your pet safe when working out. Working out with your pet can be rewarding in many ways, both for health and for the bond you share with your animal friend. By properly preparing for the workout and exercising safely, you both will enjoy a fit, healthy lifestyle. The benefits of exercise are well-documented, and as we struggle to stay fit, fitness crazes come and go. From jazzercise to home gym machines to fitness videos and video games to all manner of exercise classes, celebrity-endorsed fitness equipment and workout routines, there is always a new trend to help us stay in shape. But are our pets ready to be part of the next fitness craze? • Start workouts slowly, with appropriate warm-ups to relax muscles and prevent strains. • Time workouts to safe times of day, such as during cooler morning hours in the summer. • Use safety equipment as needed for the type of workout, such as a leash or pet life jacket. • Stay properly hydrated before, during and after the workout. • Build up the intensity and length of workouts gradually to prevent strains and injuries. • Change workouts regularly to exercise different muscles and keep your pet's interest. • Stay alert to your pet's signals for signs of fatigue, injury, dehydration, etc. • Be aware of your surroundings to always keep you and your pet safe when working out. · Start workouts slowly, with appropriate warm-ups to relax muscles and prevent strains. · Time workouts to safe times of day, such as during cooler morning hours in the summer. · Use safety equipment as needed for the type of workout, such as a leash or pet life jacket. · Stay properly hydrated before, during and after the workout. · Build up the intensity and length of workouts gradually to prevent strains and injuries. · Change workouts regularly to exercise different muscles and keep your pet's interest. · Stay alert to your pet's signals for signs of fatigue, injury, dehydration, etc. 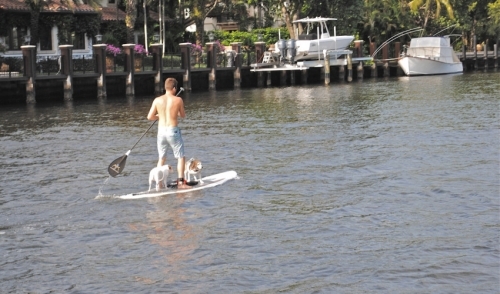 · Be aware of your surroundings to always keep you and your pet safe when working out.